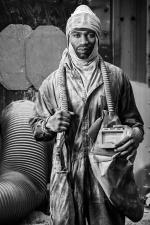 Norfolk-based photographer Glen McClure has spent years visiting shipyards throughout Hampton Roads taking portraits of the often-invisible men and women whose work forms the foundation of our coastal economy. The Chrysler Museum will present 21 portraits, while other portraits will be exhibited this summer at the Peninsula Fine Arts Center in Newport News, the Portsmouth Art and Cultural Center and The Charles H. Taylor Arts Center in Hampton. 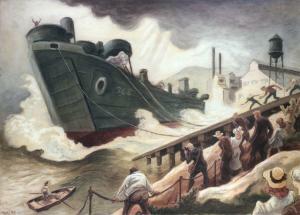 In the weeks following the attack on Pearl Harbor, famed Regionalist painter Thomas Hart Benton produced eight powerful paintings for the war effort. Benton was a Navy veteran who had been stationed in Norfolk during World War I, tasked with documenting ships’ camouflage schemes. Impressed by his Pearl Harbor works, Abbott Laboratories, a Chicago pharmaceutical company, decided to underwrite his work throughout the war. The paintings he created are on loan from the collection of the United States Naval History and Heritage Command.